Knockout roses though usually maintenance free need some pruning love once in a while to keep their shape. Actually there are two schools of thought when it comes to pruning knockout roses. One, a maintenance prune to clear out any dead wood and to keep the shape and two, rejuvenating i.e heavy pruning in Spring all the way to 6-8 inches off the ground. We planted a hedge of knockout roses on the side of our house 2 summers ago. 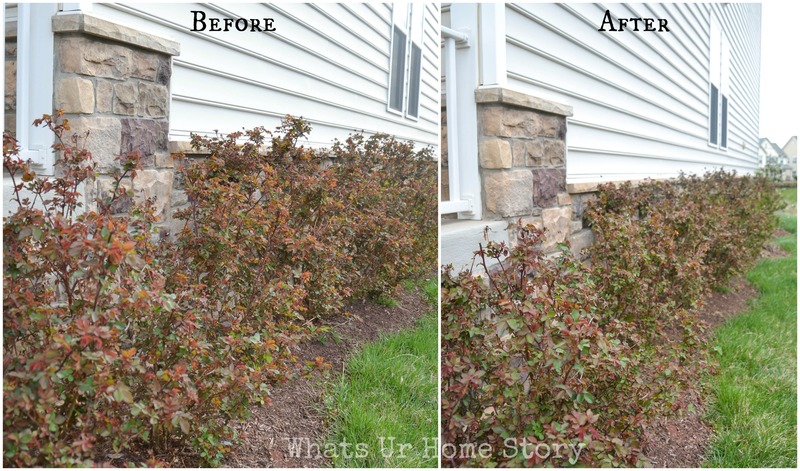 Our house sits on a slight slope and the rose hedge acts as a buffer between the stark contrast of the stoop and the lawn. So I prefer them to be tall and bushy and resort to method #1. Here’s the low down on the when and how. For colder climates where winters are harsh your best indicator is to prune when Forsythia is in bloom (which is right now for us). Where the winters are mild you could get away with pruning in Spring or Fall. You can even give it a few maintenance trims in the Summer! In general I’d wait for the bushes to be established ie. they are a few years old to prune them in Fall. In this case my marker is once the leaves on the trees starts to fall I take out my pruning shears. Pruning Shears or Loppers . I use the latter ‘coz I prefer to stay as far away from the thorns as possible. With your Pruning shears or Loppers depending upon how big you want to keep the plant prune right above the bud. Repeat to maintain the shape. Some folks like to prune away about a third of the plant. As I mentioned I just nipped away the unruly stems. For this one you definitely need to use Loppers. Prune the branches all the way to 6-8 inches off the ground. 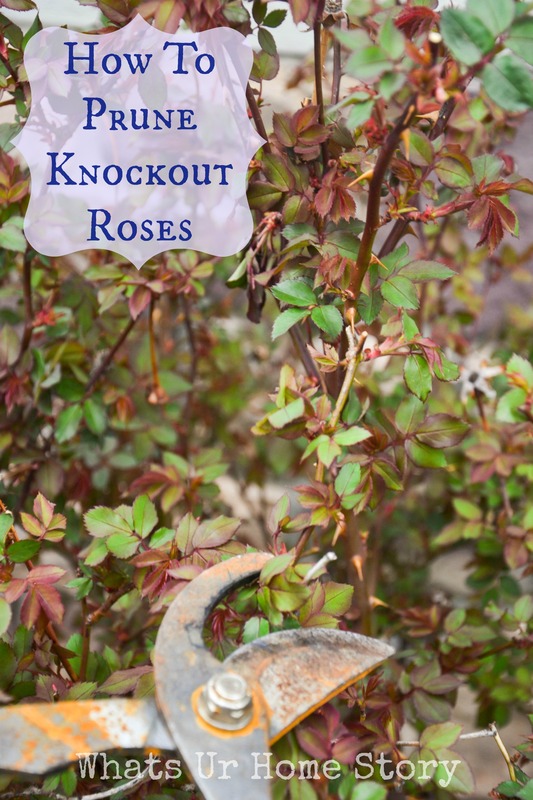 Knockout roses are vigorous growers so they will bounce right back up nice and bushy. These are my neighbor’s bushes. They pruned them like this last year too and the bushes grew back nicely. Here’s to hoping that we would have fabulous blooms like these without the Japanese Beatles troubles this year! How do you prune your knockouts? good to know! i don’t have much of a green thumb, but i do have roses. pinning! thank you for the pruning how to. just thought i’d add Neil Sperry, our garden expert in ft worth tx, always says prune the roses around valentines day. it’s a good way to remember ..
Where do you live? If you have mild winters then you could to light pruning now and do the heavy pruning in early Feb. Hope that helps. This is coming way too late for me. My hubby just played Edward scissor hands. Aww…:( No worries, they grow back great. I had to allow my husband to do the Edward Scissor hand on my knock outs last year because I was very ill all summer and couldn’t get outside. Oh Lord, when I did get out there this year to correct what he did, it took me 7 hours to get the bushes back to looking like rose bushes. Worst thing anyone can do is not pay attention to where they are cutting when they prune a rose bush. He didn’t know and wasn’t going to take the time if he did. LOL I was just grateful to have them trimmed up. Funny thing is they bloomed beautifully even though he butchered them. Vidya, my knockout rose bushes are now like trees! You think it is still a good idea to prune down to a third? I may have to try pruning one. Depends on where you live. If you have mild winters then you could to light pruning now and do the heavy pruning in early Feb. For harsh winter areas, a good prune now will be optimal. 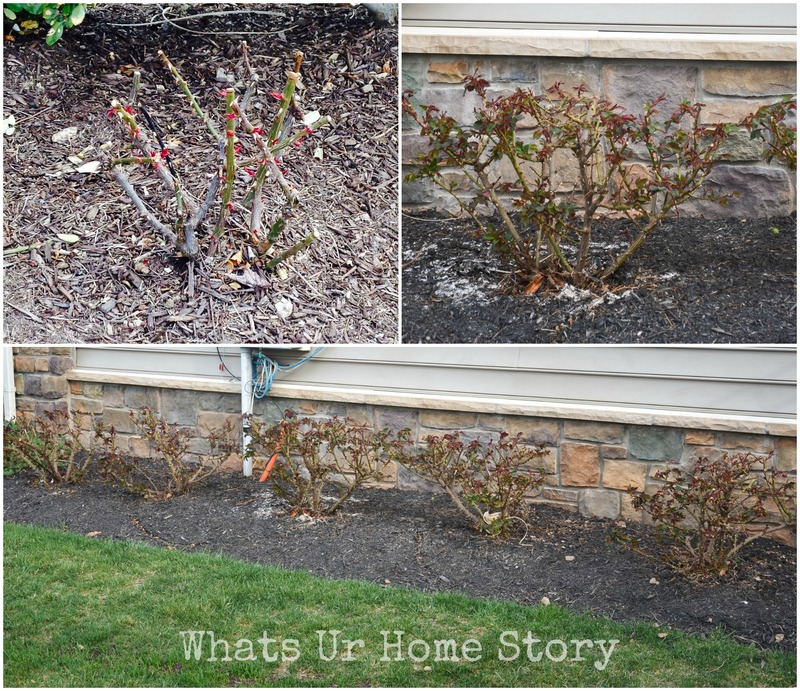 Thank you for this post,I planted mine last year and trimmed them back to 6 inches in the fall,, which scared me but they are coming back beautifully, This year I will just do a trip in April. Someone just gave me a couple of knockout roses they rooted from cuttings. My concern is they there is only one main stem coming up, which is rather tall. What would be your recommendation on pruning them so they do become bushy? Thanks so much! I would suggest letting them be the first year. See how it grows and prune as needed next year. Most rose starts that have been rooted from cuttings start out like that. The plant itself should send out new branches. What a wonderful post. I have so many knockout roses and never knew the best way to get them under control. Your blog and projects are a pleasure to browse. Thank you Lisa. I need to prune mine drastically next Spring. When ever I prune mine or even trim it up thru the warmer months or cut flowers for inside i put what i cut into water a few days, then put them in pots and most all took so i will have even more knockout bushes.. thanks for yhe great tips! 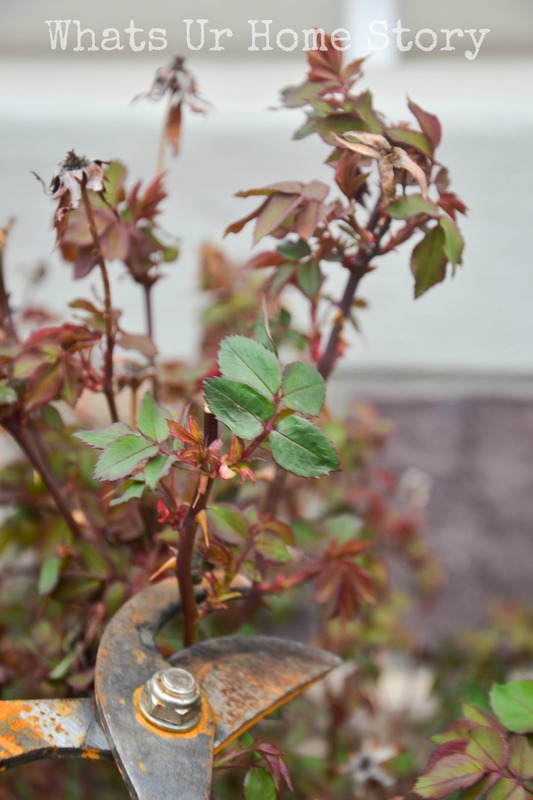 May be an old post but just reading, thanks … BTW any advice on of the bushes planted last year are spindly what to do ? You could prune them Kath. My neighbor pruned his after the first year. They look healthy. 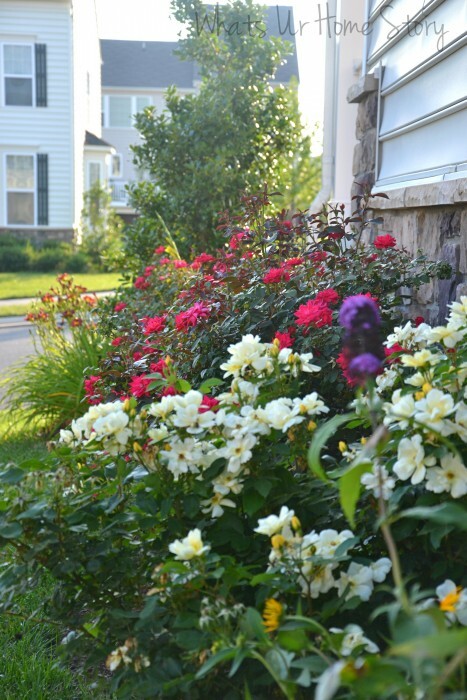 My rose bushes are a tad out of control and I am certainly not a gardener… They have gotten to be taller than me (5′) and are kind of “heavy” looking. I’m in Maryland so we can get snow and have harsher winters but nothing like further north. Can I do anything with them now? Do I need to wait until closer to fall or next spring? They are also very “wood-y”. Can I cut down to that part of the branches or do I need to stay where it’s still green? I killed one bush when we first moved into our house and I guess I’m just a little gun shy about possibly doing it again! Thanks for any input! I wouldn’t shock it completely now given the hot weather and all but you can trim it down a little bit so it is manageable. That way it will also be easier for you when you trim it all the way down in the Spring. Please do let me know how it goes.